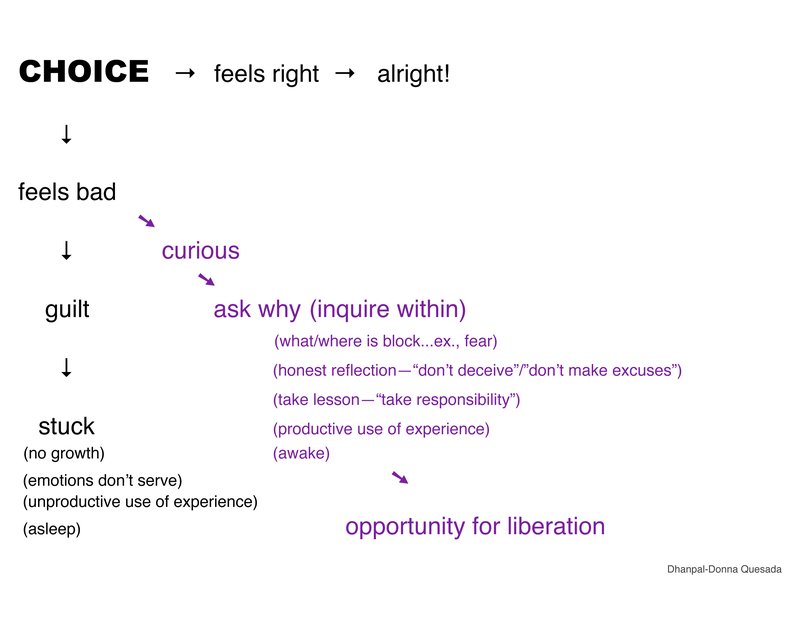 I made this chart to show the different ways of interfacing with our moment to moment decisions in life. Even the most subtle decision is vast and carries with it the potential for extensive repercussions. For example, whether we decide to breathe into a moment of frustration or channel it into verbal abuse toward a loved one makes a tremendous difference in our lives, especially, as those moments add up and habit patterns set in. I make the assumption here, that we’re not always at our optimum. But, life is a process of evolving, if we are fully awake and have the courage to look at ourselves squarely. This means embracing our freedom to make a choice at every moment and owning those decisions. Thus, it also means accepting the consequences of those choices without making excuses for ourselves. This chart shows us that only when we can truly do that, do we evolve into the optimal version of ourselves. The caveat against making excuses comes from Zen Master Nyogen Roshi, who reminded us very often, during Dharma talks, to (1) Not DECEIVE ourselves (2) Not make EXCUSES for ourselves, and to (3) Take RESPONSIBILITY for ourselves. In my book, I captured this teaching with the acronym, DER. These injunctions encourage honest, conscious reflection and enable continuous growth—which is what we’re here for! To evolve in our own way and according to our own propensity, is our overarching purpose on earth. But, sometimes we find ourselves stuck. We call it a problem when we’re unsure how to get unstuck. This chart demonstrates what Yogi Bhajan said—that there is always a pathway through every problem. Curiously, we often access this pathway by letting go. This is the feminine aspect of the dance of life. This chart shows us that even when we feel we have not acted optimally, in a situation…say, by lashing out instead of breathing, as in the example above, we can use that moment as an opportunity for conscious reflection, rather than self-reproach. For, emotions like guilt, serve only to block our growth. But the recognition that there may be some fear, like the fear of losing control, underlying our frustration, will set us free. It disables that fear. Very often, this moment of consciousness is enough for clearance to occur. As I’ve said in my classes: “a moment of awareness is a moment of healing.” This is the D, the E and the R, altogether! We haven’t deceived ourselves, we haven’t indulged in excuses, and we’ve taken responsibility, which in this case, entailed nothing more than ownership of our action. The masculine aspect of doing, comes into play inevitably, as every step, however subtle, is a form of action, but through our willingness to surrender to the outcome, we manifest the feminine. Without that feminine aspect, we lock ourselves into an insecure need to control—bereft of the trust that comes from connection to what is. It’s as Lao Tzu advised: “Know the right, but keep to the left.” The left is the feminine quality of receptiveness. And in this way, we form a relationship with the way and the rhythm of the universe. The dance of life is an interplay of masculine and feminine energies. The feminine is all about surrender, which trumps the ego’s need to control. It is a must, if we choose to grow. We must welcome what is, with a heart full of grateful acceptance, in order to go forth. We have to be good with where we are before we can get to where we want to be, since the moment we push it away with excuses, we allow the useless emotions of guilt & regret to subsume us, forming, in turn, a murky blanket of resistance to life’s lessons and the evolution of our own consciousness. It is as such that we behold the interplay of self-acceptance and self-improvement. We often defeat ourselves by trying to have the latter without the former. But, self-improvement, on its own, quickly devolves into an obsessive game of chase, creating a gap in our consciousness, between who we are and who we want to be. It leaves us un-whole. This entry was posted in Uncategorized and tagged breathing, Buddha in the Classroom, ego, free will, Lao Tzu, Roshi, Taoism, Yogi Bhajan, Zen. Bookmark the permalink.